What is common to big brands is their ability to wow their customers with outstanding after-sales service and exceptional customer experience. Research shows that 55% of customers are willing to pay more for services that guarantee a good experience. For companies looking to succeed in today’s hyper competitive environment, providing exceptional customer service at every step of the customer journey is a must. This is where Inspirria’s SuiteApp ServiceEdge comes into the picture. Completely built on NetSuite, SuiteApp ServiceEdge helps service companies get 360-degree visibility into their service and maintenance operations, fast tracking operations, enhancing efficiency, and in turn, driving customer delight. Effective maintenance operations require a well-planned approach for maximizing resource usage and delivering improved customer experience. Inspirria SuiteApp ServiceEdge enables organizations to gain complete visibility into service and maintenance operations. By leveraging the NetSuite ERP data such as inventory data, invoices and sales order, ServiceEdge help users auto-generate installation, delivery and preventive maintenance jobs. The outcome: increased insights into service contracts and the ability to execute contract terms in a timely manner. In addition, ServiceEdge easily integrates with NetSuite ERP master files such as customer, item and employee master, dramatically improving access to data in order to reduce costs and enhance growth. Enhanced control over a customer case drives faster resolution for superior customer satisfaction. Leveraging Inspirria SuiteApp ServiceEdge helps organizations automatically create customer equipment card for verification. This not only helps service personnel plan customer visits for repair/service through automatic case creation but also track chargeable and non-chargeable cases. For example, through ServiceEdge, you can automatically create warranty contracts based on date manufactured and date sold for items such as TV, refrigerators, mobiles and so on, reducing manual tasks and enhancing accuracy. Succeeding in today’s competitive environment puts the focus on better management of customer data. Inspirria’s SuiteApp ServiceEdge better equips businesses to track the entire lifecycle of a serialized item. It maintains a complete database, enabling contract-wise and equipment-wise profitability analysis. 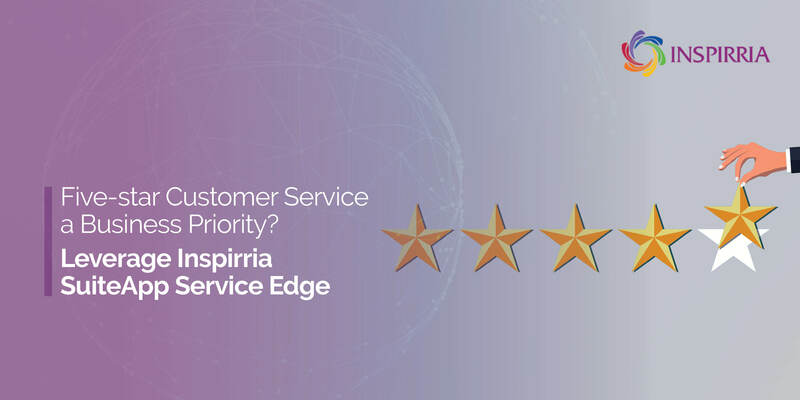 As a leading NetSuite provider, Inspirria adds value to clients through ServiceEdge by helping them take advantage of standard NetSuite Support objects such as cases, territories and knowledge base. The cloud-based service also interlinks and integrates support related master and transaction objects. This helps representatives access data anywhere, anytime. In addition, through appropriate tools and real-time information, employees are able to rapidly resolve issues as well as administer end-to-end warranty, service and rental contracts lifecycle. Inspirria is a leading NetSuite partner offering cloud technology and automation services. Through a wide-variety of cloud-based services, we helps companies better manage customers, automate processes and improve resource utilization, resulting in customer delight.